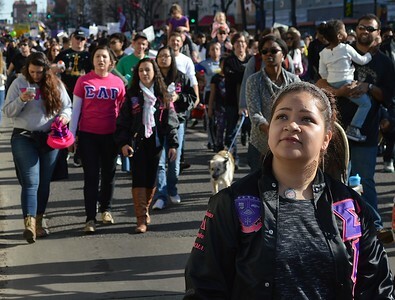 About 30,000 people marched through downtown Denver to commemorate the birthday of civil rights leader Martin Luther King Jr. Images include marchers with signs and banners, many with young children and an act of civil disobedience as some marchers sat down in the street to protest police killings in Ferguson, Missouri and other cities. 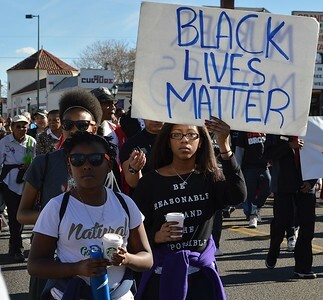 Two young African-American girls marching, one holds up sign "black lives matter", other marchers behind them. 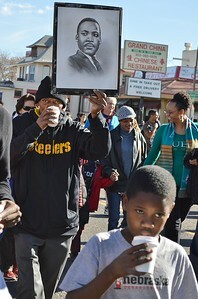 African-American man drinking from coffee cup, holding up picture of Martin Luther King, other protest marchers in the background. 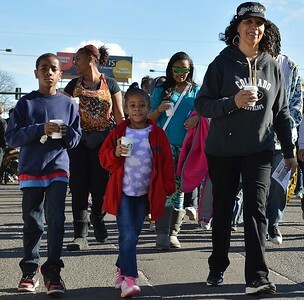 African-American mother smiling, marching with two children in MLK Day parade. 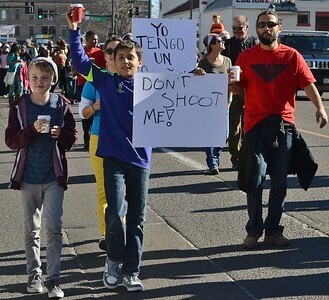 Two young boys marching in MLK day parade, one holding up sign, "Don't Shoot Me". 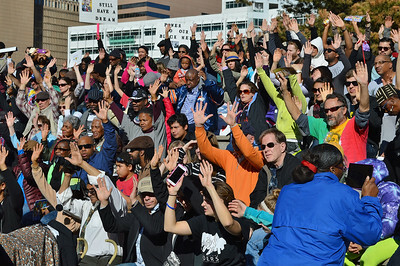 Line of MLK Day marchers with arms linked, including Colorado Senators Michael Bennet (D), Corey Gardner (R), and Denver Mayor Michael Hancock. 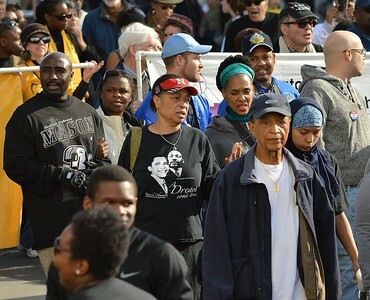 Other marchers behind them, two holding sign with picture of Corretta Scott King and Martin Luther King on it. 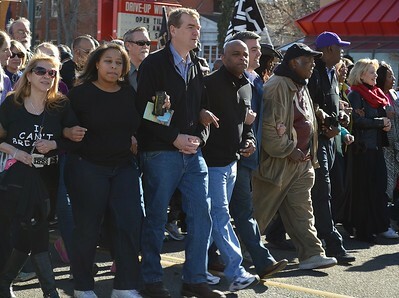 Line of MLK Day marchers with arms linked, including Colorado Senators Michael Bennet (D), Corey Gardner (R), and Denver Mayor Michael Hancock. 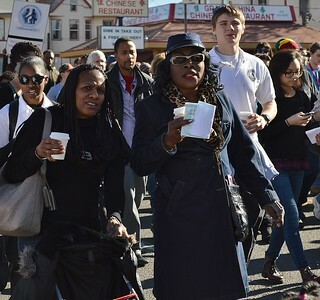 Two African-American women marching together on MLK Day, others marching behind them. 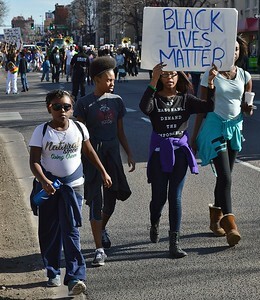 Four young African-American girls marching together in MLK Day parade, one holds up sign "Blacks Lives Matter", large group of marchers in the background. Denver Police Chief, Robert White marching in MLK Day parade, other marchers around him. 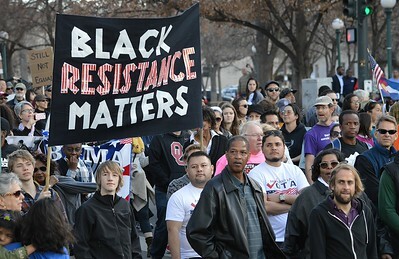 Young African-American woman marching with fist raised in the air,man raising sign above his head behind her. 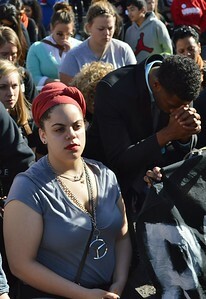 Young woman looking up in the air, large group of MLK Day marchers in the background. 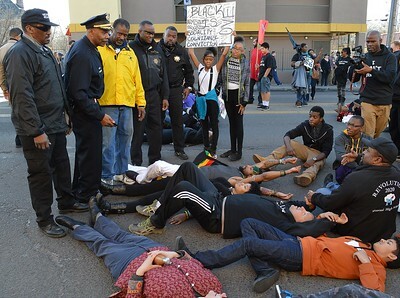 Group of protesters lying or sitting on the street as group of police officers look down at them, other protesters in the background. 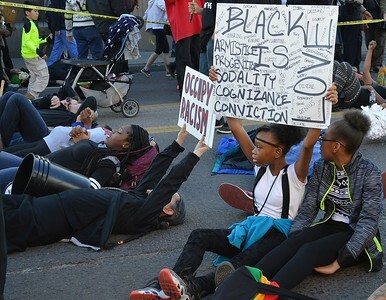 Protesters lying or sitting in the street, including young African-American girl holding sign above her head and man holding up sign "Occupy Racism". 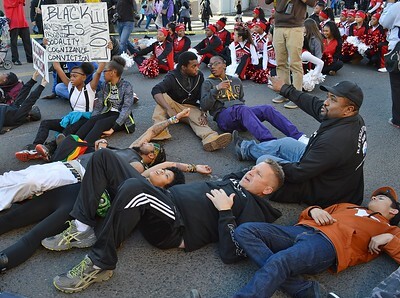 Group of protesters lying or sitting on the street including young girl holding sign above her head and group of high school cheerleaders. 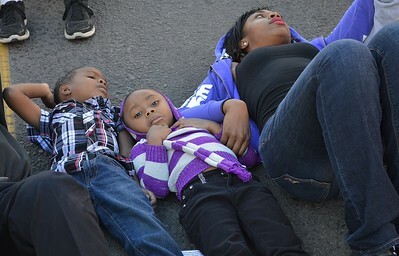 Two young African-American children lying on the street in protest, mother lying beside them. 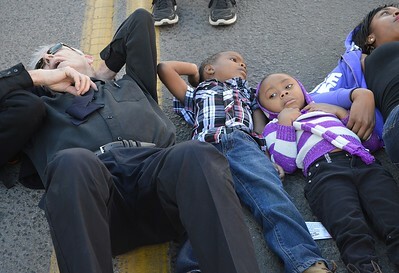 Two young African-American children lying on the street in protest,mother and man lying on either side of them. 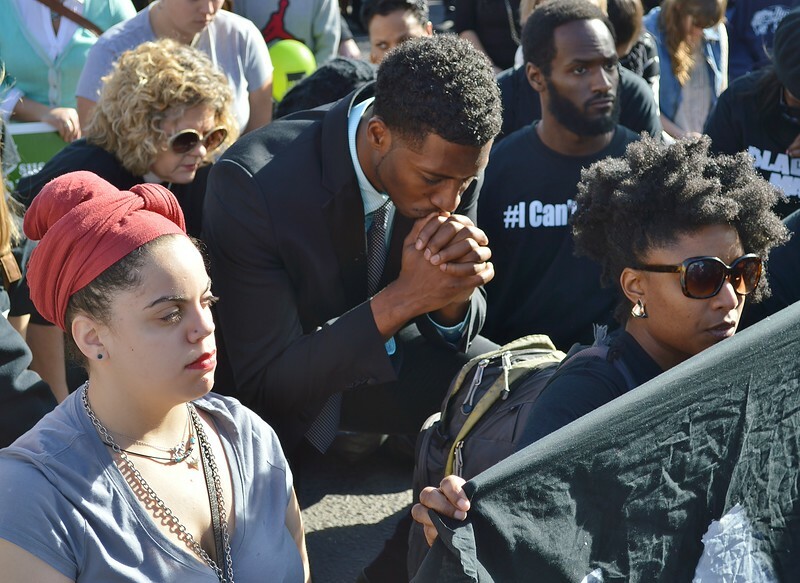 African-American, bowing head and hands folded in prayer, other protesters sitting in street next to him. Large group of marchers in MLK Day parade, including former Denver Mayor Wellington Webb, some with signs. 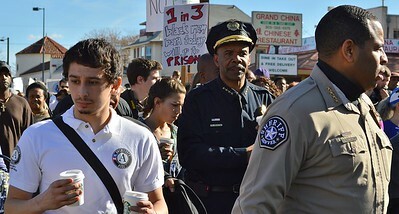 Denver Chief of Police, with hand on head, walking in MLK Day parade, large number of marchers around him. Woman in middle of large group of MLK Day marchers, holds up a sign about beating and killing of young people, also in crowd, man carrying young daughter up on his shoulders. 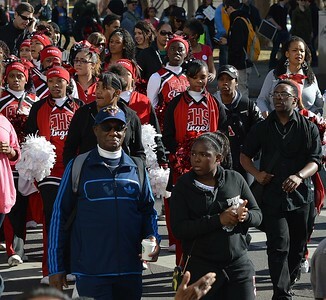 Group of high school cheerleaders walking together in MLK Day parade, other march around them. 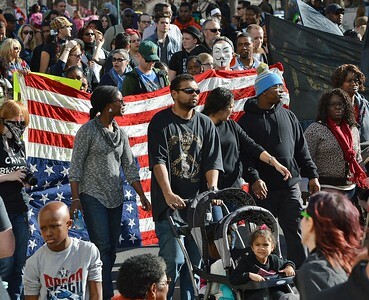 Afican-American in MLK Day parade, pushing child in stroller, wife next to him, protesters behind them carry upside down American flag, including one wearing Guy Fawkes/anonymous mask. 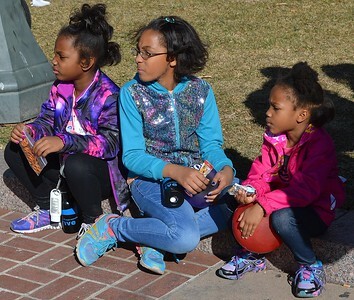 Group of young boys at MLK Day parade, smiling and laughing, behind them woman gestures with hands while talking to woman next to her. 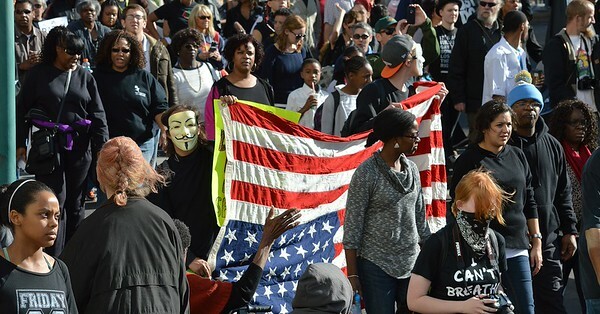 Man wearing Guy Fawkes/anonymous mask carrying an upside down American flag in MLKDay parade, many other marchers around him. 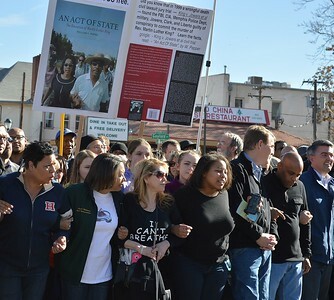 Large group of MLK Day marchers, including African-American woman waving, another woman talking on cellphone, one woamn taking a cellphone picture. one woman speaking into a bullhorn. 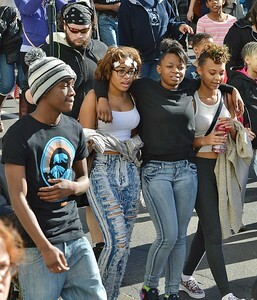 Three young African-American girls with arms around each other, walking in MLK Day parade, other marchers in background. 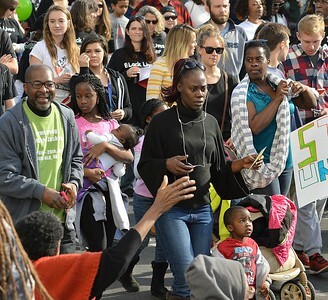 African-American woman in MLK Day parade, her young child walking in front of her, behind her, young girl carrying young child, other marchers in the background. 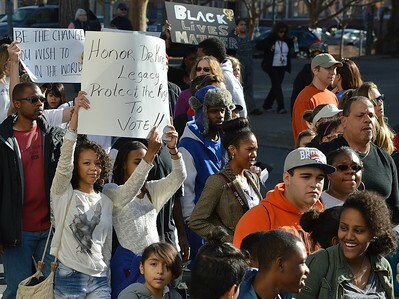 Two young African-American girls holding up sign about "Dr King's legacy", other MLK Day marchers in fron of them including man wearing Denver Broncos cap. 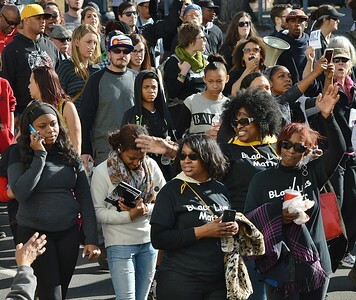 Large group of MLK Day marchers seen from above and behind, fill a city street. 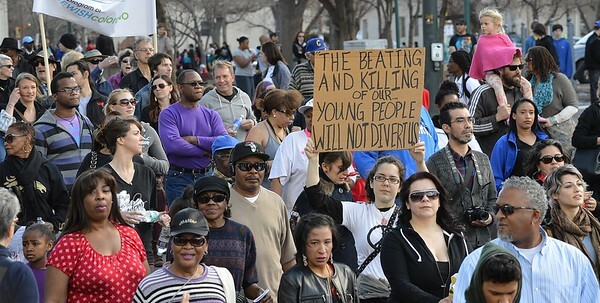 African-American woman holds sign above her head about black workers, in front of her a young African-American man. Young girl wearing pink sweater riding on top of her father shoulders at MLK Day parade. Group of marchers at MLK Day parade, including young African-American man holding red water bottle. 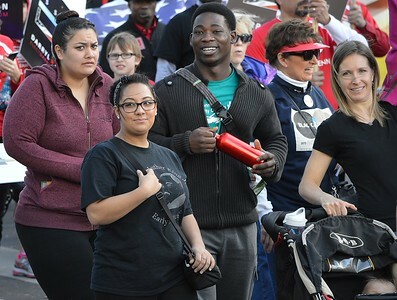 African-American woman wearing shirt depicting Barack Obama and Martin Luther King, gestures with hands while talking to woamn next to her, other MLK Day marchers in the beckground. Large group of marchers at MLK Day parade including two holding up banner that reads "Black Resistance Matters". 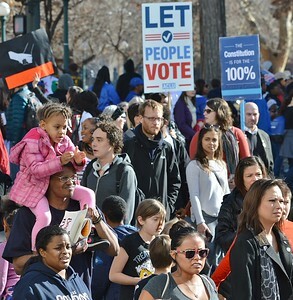 Group of MLK Day marchers including African-American man holding young daughter up on his shoulders, in background another protester holds up sign that reads "Let People Vote". 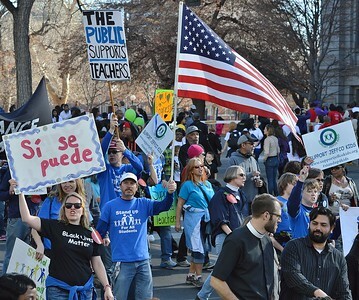 Teachers marching in MLK Day parade, including one holding up a large American flag, another holds up sign reading "Si Se Puede". 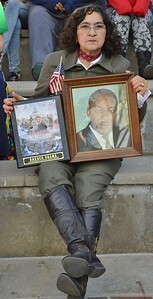 Senior woamn sitting on step holding photo portrait of Martin Luther King and picture of President Barack Obama and American flag. 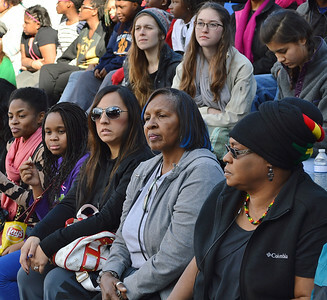 Group of women listening to speaker at MLK Day rally. 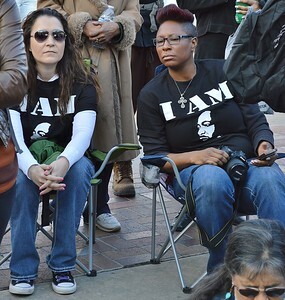 Two women sitting together at MLK Day rally, both wearing shirts depicting Martin Luther King, one holding camera in her lap. 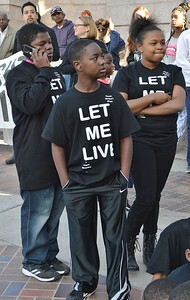 Three young children wearing t-shirts that read "Let Me Live", one speaking on a cellphone. 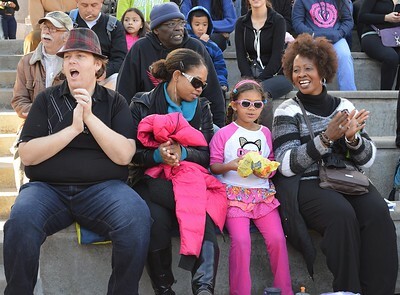 Man and woman clapping at MLK Day rally, young girl with sunglasses on sitting between them. 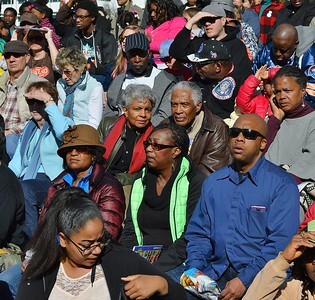 Older African-American man and woman listening to speaker at MLK Day rally, behind thyem, man wearing jacket with Presiedention Seal on it. 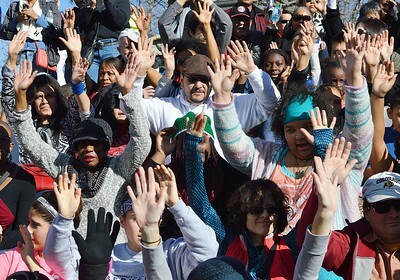 Large group of protesters at MLK Day rally holding hands up in the air.